Randomly RemindMe provides a great solution. 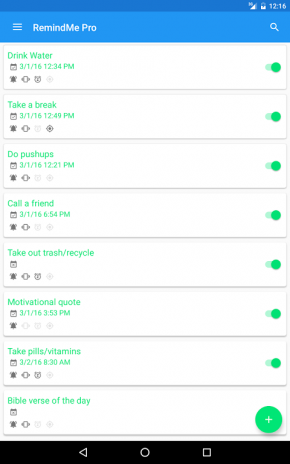 It's an Android app that allows you to fully customize your reminders. Rather than having to schedule an item for a specific time and day in your calendar, you can, for example, tell Randomly RemindMe to remind you to get up and stretch every hour. As the title suggests, you can set "random" reminders as well. These reminders will pop up randomly on a daily, weekly or monthly basis, depending on your settings. This function is great if you need weekly reminders to call home or check in with a friend. If you want to reminders on a more structured schedule, you can choose the specific time to receive it, or set it to regular intervals like every few hours or days. RemindMe can also serve as a great habit tracker. Do you want to stretch three times a day, eat meals at certain times or to simply step away from your screen every couple of hours? Add the reminders to this app and let it do all the thinking for you. When a reminder pops up, you can choose to click on it or dismiss it. RemindMe will track these clicks so you can go back and see how many times you've followed through and how many times you've ignored the reminder. Randomly RemindMe is available for free on Google Play.